Hatfield Metal Fabrication provides complete ASME engineering design and manufacture for ASME code tank fabrication. Hatfield Metal Fabrication is an ASME certified manufacturer and can produce ASME tanks in stainless steel, carbon steel, aluminum, and other alloys as well. Non ASME tanks and vessels can also be produced. Our engineers and project managers can help our customers in all areas such as engineering, layout, fabrication and testing. Our ASME tanks are manufactured under strict quality standards following ASME protocol. All material test certificates and ASME forms are made available with every tank. Our customers expect the very best and Hatfield Metal Fabrication has been proud to establish a culture that delivers on-time quality ASME tanks. Hatfield Metal Fabrication is also a PED pressure vessel manufacturer, and can manufacture PED pressure vessels to the European Pressure Equipment Directive or “PED” which requires that pressure vessels imported into any European Union Member State must bear the "CE" mark. 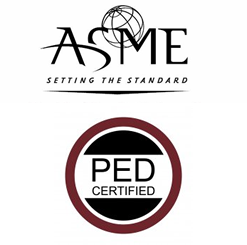 We have obtained PED welding procedures/welding performance qualifications makes Hatfield Metal Fabrication a certified PED welder and PED vessel fabricator.